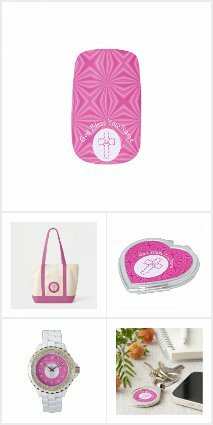 Hot or bright pink is the most noticeable color in this design, showing in this collection of accessories with a feminine hard rock Christian theme. Because, who says Christians are stuffy? In creating the design, Auntie Shoe took a cross from a freeware font that the font maker allowed her to have. She colored it a hot or bright pink. Because it looked a little sparse, she placed in on a white, circular background that mimics a fractal-style. Surrounding the circle is a matching pink background of squiggly squares. What are squiggly squares? Squiggly squares is the name Auntie gave the background image because she didn’t know what else to call it. Auntie Shoe loves pink. In her advancing age, she has stopped caring what people think of the color. Yes, there is a story here. Auntie’s daddy and his friend, Lars, who Auntie adored when she was nine, discussed favorite colors in front of her. They agreed that people that liked pink were a little dull. And, as young child Auntie mistakenly believed that her Uncle Lars would not love her anymore if she liked pink. Hey, she was nine. But, in her advancing years, Auntie realizes that this is silly and she can like pink if she wishes. She does. So she does. Auntie Shoe placed this collection at Pinterest in a group board she posts in called Accessorize Your Life. You can see a lot of different items there with a ton of gift ideas for mom and your favorite grad. It is a great place to find birthday gifts for any lady in your life. Also, there are a lot of tote bags that are always handy for any occasion. 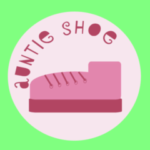 Also, you can follow Auntie Shoe at Pinterest by clicking here.